I've been wondering how to compile this post for some time now. Because quinoa (pronounced keen-wah) deserves such star treatment, a red carpet entry and the whole world to see it in all its glory, I was a little nervous to choose a recipe to showcase it. I eat quinoa at least two or three times a week - for breakfast, lunch, dinner, a snack, or dessert. Because there are so many yummy ways to enjoy it, I realised I'd never be able to choose the one perfect quinoa dish to share with you. So a few nights ago I made a promise to myself - the next time I cook quinoa, I'm taking photos, writing down the recipe and posting it. No second thoughts! Just hurry up, get on with it and share the quinoa love. That was while I was tucked up in bed and drifting off to sleep. As it turns out, the next morning I found myself in the kitchen all giddy and excited preparing chocolate quinoa breakfast pudding in a pot on the stove. Recipe block over. I was soon to have a satisfied tum and my quinoa blog post - double win! I've been enjoying quinoa porridge and the like for breakfast for some time now, but on this particular morning, I had some oats that needed finishing, a craving for a sweet treat and a friendly jar of cacao giving me eyes from the pantry. If the idea of pudding for breakfast is a little too much for you (although I'm sure most of you will feel quite fine about the idea, just this once, right?) then feel free to save this recipe for a more dessert-appropriate hour. Alternatively, you could leave out the cacao so it's not so rich. Otherwise, follow as I do - pudding for breakfast? YES PLEASE. Quinoa has been enjoyed and consumed in South America, namely the Andes region - Peru, Equador, Bolivia and Columbia for thousands of years. It has been said that the Incas considered it a sacred crop and called it the 'mother of all grains'. And that it is! Well, kind of - interestingly, although quinoa looks much like a grain, it is actually a seed. I've even heard some call it a pseudo-grain. Whatever you like to roll with - grain or seed - quinoa is delicious and bursting with nutritional loveliness. I especially love this wonder-seed for it's protein-rich qualities - unlike many other grains, seeds or legumes, quinoa boasts all the essential amino acids. Amino acids are what make up the protein needed in our bodies in order for us to function. Essential amino acids are essential because the body cannot produce them on it's own and must obtain them from specific foods. A combination of all essential amino acids are sometimes harder to find in plant based foods and are more commonly found in meat. But hoorah to quinoa! - A plant based food that gives it all. Quinoa is full of fibre, phosphorus, magnesium and iron, is low in fat, has a good dash of calcium and is gluten free. In other words, it's full of all the good stuff! Taste wise it is very unique. I love it's nutty, earthy flavour that is interesting enough to really boost a dish, yet mild and versatile enough, allowing it to be prepared in both sweet and savoury dishes. You'll find quinoa at any health food store, and in recent years I've noticed it popping up at some supermarkets. I recommend hitting your nearest health food shop though as you can usually buy it in bulk there and for a more affordable price. Now, I think I have given you enough reasons to jump on the quinoa-wagon, if you haven't already! I've also expressed my deep love for cacao and some of its nutritional benefits in an earlier post. So when I combine this chocolatey goodness with my great mate quinoa, I've got myself some serious soul-mate action in a bowl. Gluten Free Option - Please note, I have called for rolled oats in this recipe however they are not always gluten free due to the wheat products they can come into contact with during processing. If you are gluten intolerant make sure the packet confirms they are gluten free. Alternatively you can replace the 1/3 cup of oats with extra quinoa - In the initial stages add 1/2 cup quinoa with 1 1/4 cups of water. When the recipe calls for oats, instead add 1 Tbls chia seeds and continue adding a dash more water or milk as the recipe suggests till the mixture reaches your desired consistency. 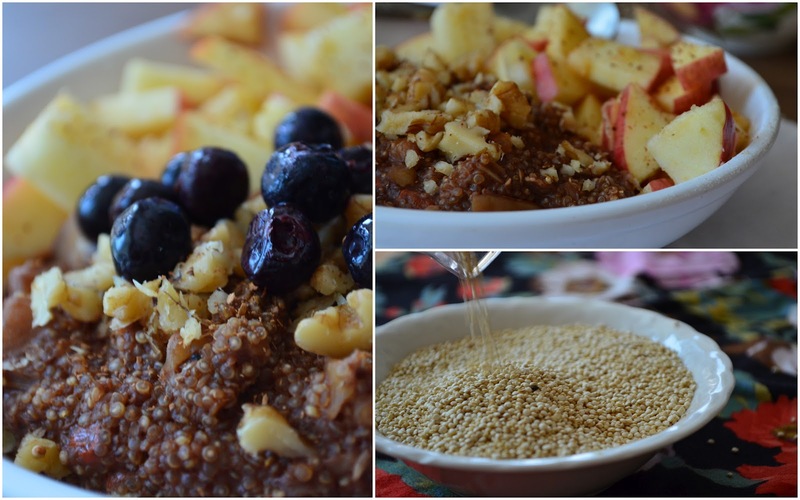 In a pot on the stove combine quinoa with water, half of the chopped apple, cinnamon, dried fruit and honey. Bring to the boil, give a quick stir and then lower to a simmer. Cover with a firm lid and leave for 12 minutes (I use a gas stove which gives me a lot of control over the heat. If using an electric stove, you can always try turning the element right off for the twelve minutes as the element sometimes take a while to cool down. If you know your oven well, you'll know what is best to achieve a 'simmering' temperature). After 12 minutes, remove lid and give the mixture a stir. Keep the element on a simmering heat. Add cacao powder and half of the walnuts and combine. Next add the oats and stir together. The mixture will immediately dry out so add a Tbls of water, then Tbls of milk intermittently while stirring, until you have used all of the milk and the oats have cooked. During this process the oats and liquid will bring all the ingredients together to make a porridge-like consistency. Feel free to add more or less liquid if you think it is necessary. Pour into a bowl and top with the rest of your apple, blueberries and a sprinkling of walnuts. Add an extra dash of milk if you'd like and sit down to enjoy this delightful sweet-treat breakfast that's super packed with healthy goodness to set you up for the day. *It's a good idea to wash your quinoa before eating it due to its saponin coating. This coating naturally occurs during cultivation and has a bitter taste which is undesirable to birds that might otherwise try to destroy the crop (pretty cool what nature gets up to, huh?). 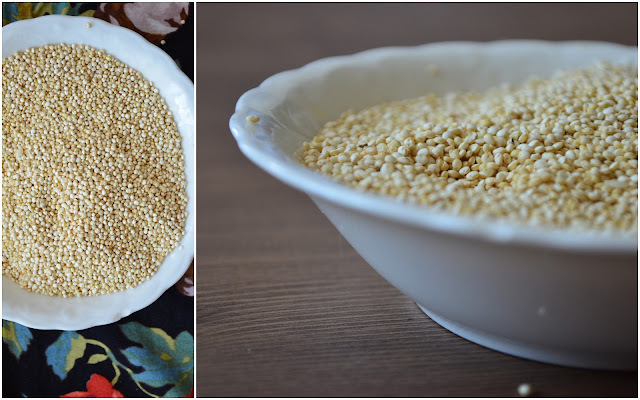 If you've a fine sieve, place quinoa inside and run water through it while massage it with your hands. Even better, leave your quinoa soaking over night and then rinse clean before cooking.